A new tag IC that can wake up a host device when it senses another NFC device in close proximity is now available from chip maker NXP. Like the already-available NTAG203F, the NTAG21xF family of tag chips (PDF) is designed for use in consumer electronics and mobile devices and connect electrically to both an NFC antenna and the items they are built into. The chip’s field detection mode can then be used to switch on the device when it detects an NFC interaction. The tags can be built into products such as headsets, sound bars and digital cameras as well as wearables such as smart watches, says NXP, and can be used for initiating Bluetooth and WiFi pairing as well as other uses. The chips incorporate NXP’s second generation security features and also include a sleep mode, which allows the host device to temporarily disable the NFC tag. This enables the electronic device to hide its built-in tag from other NFC devices — a feature which NXP suggests could be useful if the host’s battery level is too low or for privacy reasons. 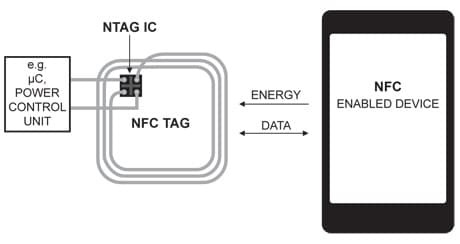 The ICs are NFC Forum Tag Type 2 compliant and are available in two versions, with the NTAG213F offering 144 bytes of memory while the NTAG216F has 888 bytes. The chips went into mass production in mid-July and are now available for sampling, NXP has told NFC World.